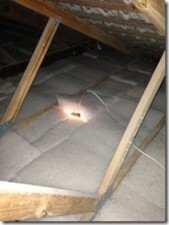 Insulation in this roof void is in contact with the back of the recessed light fixtures causing a potential fire hazard. Insulation must be kept clear of the backs of recessed lights by at least 200mm or a cowl (available from all electrical supply stores) should be placed around such lights to prevent insulation from contacting lights. This entry was posted in Blog on August 28, 2014 . 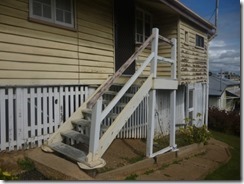 BPI Melbourne finds signs of movement to rear verandah. Unsafe handrail – large gaps. Whether shopping for a new home, selling a current property or just curious, knowing what to expect from the property market in Melbourne is extremely important. From what the interest rates are going to do with how well homes are going to sell, all of this can be forecast, to some extent, for the upcoming year. So, for anyone who is looking for this kind of information, it is possible to find it. This is what to expect from the upcoming property marketing this coming year. Naturally, interest rates have a very important role on how the housing and property market turns out. In 2014, the interest rate was at one of the lowest points in the history of the country. This was not just for Melbourne and the rest of Australia, but for many locations throughout the world as well. Now, more likely than not, the interest rate is still going to remain low throughout 2015, but chances are, it is going to raise at least a bit. Currently, it sits right at around 2.5 percent. It is still potentially going to sit under 3 percent, but not by much. This is still a nice price for those looking to buy a home, but it is going to be higher than before. This is because the government does expect more people to start looking for places to purchase, which means it is going to increase the internet rate, at least somewhat. Now, the interest rate is not just going to jump instantly. It needs to happen slowly in order to prevent killing off the housing market, but it is, at some point, going to happen. Unemployment also has a factor in the property market. When someone is struggling with work, they simply are not able to go out and purchase a new home or really anything else that they might that is on the larger side (such as a new vehicle). Currently, the unemployment rate sits at around six percent. It is expected that the unemployment rate is going to increase slightly to anywhere between 6.1 and 6.25 percent for the year, although this can always change. It should not have a drastic impact on the housing sector, but it may mean there is slightly fewer people looking to buy a new home in Melbourne. Beyond this, the price of houses is still a bit high, which is going to hold the market back. This entry was posted in News, Property Market and tagged Melbourne, Property Market on February 3, 2015. House prices in Melbourne have tentatively risen by 11.7%, between 2013 and 2014. The median house prices in Melbourne were up 5% in December from the September quarter, to stand at $669,000. The breakup in the property market segments indicates that the prices in outer Melbourne rose by 8.9%, prices in middle Melbourne went up 13.2%, while prices in inner Melbourne rose by 11.7 percent. In 2014, the Melbourne auction also witnessed a record-breaking performance with 40,000 auctions. Kew suburb remained the fastest growing suburb with an impressive 18.3% growth rate and a median house price of $2,035,000. Kew is followed by Carlton North, Dromana and Northcote which recorded 17.4%, 16.5% and 16.4% growth rates respectively. In the 4th quarter of 2014, four Melbourne suburbs joined the million dollar class, they were Richmond, Northcote Flinders, and Strathmore. There is a total of 59 suburbs in this closely followed rich list. The suburb’s that made a comeback back into the list include Clifton Hill, Aberfeldie and East Melbourne. One of the elements attributed to the swelling of the million dollars median price list is the benefit of ripple effect. Case in point is the house price increases in Northcote, which is attributed to a flow in-effect from Fitzoy North. Toorak remains the most expensive suburb in Melbourne with a median house price of $2.85 million. Deepene comes second, with a median house price of $2.25 million. followed by Canterbury with $2.2 million. The region of Victoria also recorded a rebound. In December, the Victoria regional median house prices rose up 5.5% to $344,000 from September. There was also a 4% price rise in apartment and median units to $257,000. Despite the cross-sectional growth in the Melbourne median house prices, there were several price variations. The variations were attributed to factors like access to key transportation corridors, seasonal demands, and employment rates. Other price determining factors includes unemployment rates, and business and consumer sentiments. The disparity in the median price range was as high as 25.1% in Colac Otway and as little as a 4% change in the City of La Troupe. Analysts predict that the 2015 autumn season will remain solid as long as interest rates remain low. This entry was posted in News, Property Market and tagged Bpi North Melbourne, Real estate on March 17, 2015 .